Drama 'SPY', A Usual Family Is Endangered For What? [by Woorim Ahn, photo by Kwon Hee Jung] How would you feel if one of your family members is a spy? KBS new drama 'SPY' depicts a warm family story, but at the same time, it has the stories of hidden dangers of a specific family. The production and press conference of KBS drama 'SPY' was held on January 6 at the Grand Ball Room of Ritz-Carlton Hotel in Gangnam, Seoul. Bae Jong Ok, Kim Jaejoong, Yoo Oh Sung, Ko Sung Hee, Kim Min Jae, Cho Dal Hwan, Ryu Hye Young and main producer Park Hyun Suk gathered altogether to hold production and press conference. First of all, the event began with KBS Drama Department Director's short speech. He said, "KBS and the producer tried their best to contact with original drama of 'SPY', which is Israel drama 'MICE'. They could finally get permission and reproduce the drama into Korean version." After the short speech of the director, a 10-minute preview video of the drama was on the screen. Although it was short, the video left a strong impression of the actors and actresses starring in the drama - it was more likely a movie. It was the producer who started to tell about the drama. He introduced his drama by saying, "I tried my best to produce laughter for everyone. I could make it possible since there were many actors and actresses that decided to work with me. From the first episode to the last one, I will put everything into this work to make the audience laugh and enjoy." Since it was first time for Jaejoong to star in KBS dramas, he revealed his thoughts about it. He kept saying "I like it" over and over again to highlight his thrill of appearing in KBS drama. About a question asking his tips in kiss scenes, he said, "I think Ko Sung Hee is an alluring actress. After a romance scene with her, it lingers in my mind. As much as this, she is a great actress." Despite of a mischievous question, he kindly answered without being embarrassed. Jaejoong’s colleague Cho Dal Hwan mentioned about Kim Jaejoong’s first impression, “When I first saw him face to face, I was surprised at his good look. I thought he was a character from a cartoon. Actually, before I met him, many of my colleagues kept complementing him, so I was curious how he really would be and he is really nice and kind. He looks a bit cold and chic, but he is not” and praised Jaejoong. Would Kim Jaejoong make his pledge come true? Drama ‘SPY’ has a unique story unlike typical love story dramas. Jaejoong’s family in the drama has to deceive each other for the family. Among the conflicts, the drama will depict growth and reconciliation between the family members. Kim Jae Joong opened up about his friendship with Im Si Wan. 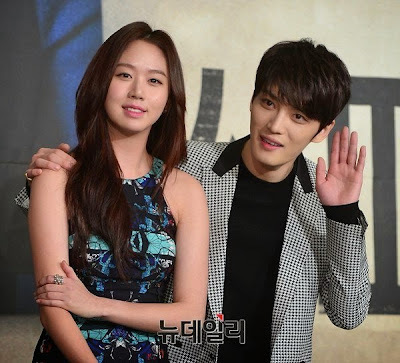 On January 6, KBS′ Spy held its press conference at the Ritz-Carlton Hotel Grand Ballroom in Yeoksam-dong, where JYJ′s Kim Jae Joong shared that he and ZE:A′s Im Si Wan, whom he worked with in MBC′s Triangle, call each other often. "The Triangle actors and I sometimes grab drinks and stay in touch," said Kim Jae Joong. "We don′t always just talk about acting, and in the case of Im Si Wan, he called saying that filming tvN′s Misaeng is more difficult." "When he′s resting, I get a lot of calls saying it′s really hard. I don′t know why he calls me when he′s struggling, but because we live close, he says things like, ′Let′s eat′ and ′I want to drink." Kim Jae Joong added, "I recently ate with Shin Seung Hwa hyung, Lee Yoon Mi nuna, and Shorry hyung. Once I do a project together, I continously contact them and meet. I don′t think we really talk about work during that time." KBS′ new drama, Spy is based on the popular Israeli drama, The Gordin Cell, about a mother who risks everything for her son and the son who discovers his mother′s hidden past. The drama will begin on January 9, airing back to back episodes from 9:30 PM to 11:10 PM KST. Being disturbed by Mother Nature, JYJ′s Kim Jae Joong and Ko Sung Hee had to re-shoot their kiss scene. 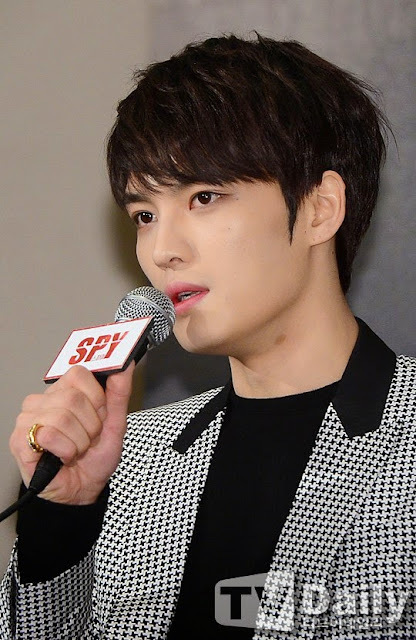 On January 6, KBS′ Spy held its press conference at the Ritz-Carlton Hotel Grand Ballroom in Yeoksam-dong, where Kim Jae Joong shared a behind-the-scenes story of his drama kiss scene. Recently, Kim Jae Joong and Ko Sung Hee′s romantic kiss scene has caught attention. The two spent over three hours as snow fell to film the scene. Regarding the kiss scene, Kim Jae Joong began with, "It was extremely cold." "The wind chill was almost negative 20 degrees Celcius and it started snowing all of a sudden. The picture was really pretty. The snow fluttered like we had planned it. 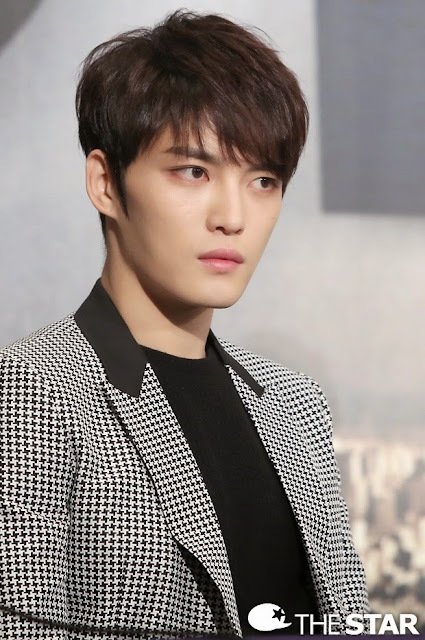 Then huge snowflakes started to fall, followed by rain, and then it turned into hail and fell," explained Kim Jae Joong, who appeared a bit bitter about having to refilm the scene over again. Jo Dalhwan: When I first met Jaejoong it felt like he was Terius walking out of the anime. I even wondered if he is really human. Jo Dalhwan: Jaejoong's eyes are so big it makes people nervous. His pose is the best in Asia when he's facing the clock direction of 10:10. Jo Dalhwan: My colleagues and juniors called and gave generous compliments of Jaejoong, saying he is a very compassionate person.